Exercise Lucky 13 - The two percent solution, how is it important? 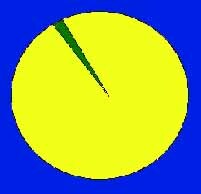 The green portion is 2% of the circle. 1. What percentage of California's 5,000 native species of plants are available in bulk seed form in the year 2000? 2. How can we increase the percentage of native species available in seed form? 3. Of California's native ecosystems and native plant communities below 3,000 feet elevation, what percentage of cover Statewide still exists in the year 2000? 4. How can we preserve and increase the percentage of intact native ecosystems and native plant communities?